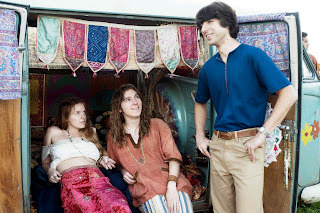 Fourth Row Center: Film Writings by Jason Bailey: In Theaters: "Taking Woodstock"
Taking Woodstock isn’t a bad picture, but the problem is that it knows the words and not the music. The director is Ang Lee and the screenwriter is James Schamus; they’ve proven one of the most fruitful director/writer collaborations of modern cinema (Schamus wrote or co-wrote all of Lee’s features to date, save for Sense and Sensibility), but this time, there’s something just a little off. The exposition is surprisingly clumsy (particularly the early scenes with the banker and with the sister), and there’s a strange, listless quality to its early sequences. It’s not that it doesn’t play—it’s just that you keep waiting for it to catch fire. The film tells the true story of Elliot Tiber (stand-up comic Demetri Martin), a would-be artist and designer slumming it in his parents’ ramshackle Catskills resort. He then hears that a neighboring town has pulled the permit for the upcoming Woodstock music festival, and offers up an alternate location—providing a permit, a nearby farm, and, of course, accommodations. In doing so, he ends up with a front-row seat as the festival spins out of control and away from expectations, and becomes the event that defines his generation. All of that is well and good, and once the hippies start showing up and the festival gets into full swing, there’s a lot of Taking Woodstock to like. But boy does it take some time to get going. The first half of the film is downright rudderless, meandering oddly from scene to scene, and the punch lines don’t quite land; the picture is being marketed as a comedy, but Lee’s timing isn’t quite right. And as much as I like Martin, he just may not be leading man material—he’s a little too bemused, too low-key and low-energy, to really carry a movie. I can see why Lee cast him; in the second half, Martin does a fine job of projecting the quality of an innocent drinking it all in (a concept that works from the viewpoint of boilerplate narrative, though his naiveté seems somewhat at odds with the character’s bohemian past). The second act’s uptick also owes a great deal to the presence of a be-dragged Liev Schreiber, who waltzes in around the halfway mark and all but steals the picture. Eugene Levy is also quite good (he’s spot-on as likable but practical Max Yasgur), and Dan Fogler is actually tolerable (a first for him), though Emile Hirsch fails to make much of an impression. There’s a wonderful moment when Ritchie Havens’ voice floats over from Yasgur’s Farm, and Elliot smiles and says, “It’s starting.” The film’s sound design is inventive; once the concert begins, we hear distant but recognizable performances, always off-screen, but present and lending context and atmosphere. In fact, Taking Woodstock is near-perfect, technically; the editing frequently apes the split-screen cutting of the Woodstock documentary, while Eric Gautier’s cinematography is so spot-on, you’d swear they grabbed some outtakes from the original doc. And it has one truly magnificent shot, which tracks with Elliot as he moves slowly through the various festival goers and observers. But even once the narrative takes off, the script keeps letting us down; the business with the hash brownies (seen in the trailers) is a lazy, easy laugh, and the dialogue in Elliot’s last scene with his father is so trite and cliché, you can sit in the audience and write it yourself. Again, Taking Woodstock is worth seeing, and there is much in it to recommend. But it’s ultimately passable rather than exceptional, and from Lee and Schamus, that’s a letdown. "Taking Woodstock" is currently playing in theaters.